Auntie Em's Studio: Happy third birthday! My nephew's third birthday is coming up in a couple of months and I got an early start on his gift. 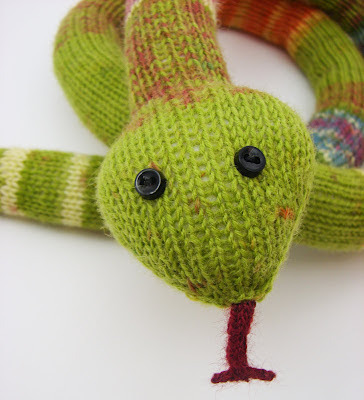 I saw the idea for this snake in Susan B. Anderson's Itty-Bitty Toys, which I recently lent to a friend. Being the impatient knitter that I am, I ran out and bought some self-striping sock yarn and made my own pattern. 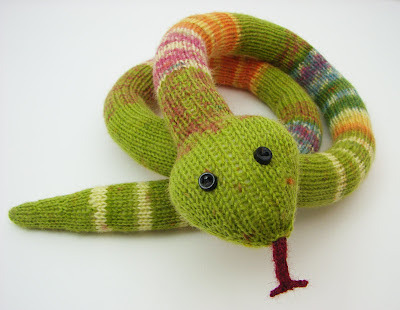 With a few simple increases and decreases, most of the work was just knitting in the round and the yarn did the rest. I'm quite happy with how he turned out and I can't wait to give him to my nephew. I still have to wait another month or so. That's what I get for starting early! It's better than rushing to finish last minute, though.